Instead we discuss the few years he spent living in San Diego and Newport Beach which explained his near-perfect English. As the ruggedly handsome Fernando attentively maneuvered around boulders, across cattle crates and through dense scrub accented by vibrant white Plumeria, he was far more comfortable discussing the native vegetation. He’s relationship with the area unfolded like a romance novel. With amorous revelry he tells me about the months he spent exploring the Isla Espiritu Santo off the La Paz coast, finding ancient human remains and cave paintings. He bought a little home in El Gallina (El Rosario) because he feels at home in the tiny pueblo. Somewhere, high in the Sierra Laguna range he has built a little cabin. It takes nine hours by mule to reach it but Fernando’s description of this mountain paradise has me wanting to sign up for the trip. I was greatly enjoying his love story so I made a mental note to Google my way to answers about his family when I got home. Our afternoon consisted of visits to two ideallic towns settled high in the mountains, San Antonio and El Triunfo. Both tiny towns were born of mining boom in the mid 1800 and many residents have Anglo surnames to tie them to the American and European mining companies that prospered here. Cobbled stone streets and lovely old adobe homes perched at all angles on the mountainous slopes, awash with the pale pastel colors that once coated all homes in this area – before dairy companies and quicky marts introduced the neon color scheme that has raised the intensity of palates through Mexico. Imagine if every Starbucks in America where painted like a Tennessee Titan’s game jersey –now you’ve got the idea. As we rolled past San Antonio’s plaza two local equine residents came clopping our way – as if two young lovers out for a stroll. The lovely blonde horse strolled nonchalantly into the plaza, passing the gazebo and sipping from the fountain. Her dark and brooding suitor stood high on the will watching her ready to canter to her defense if need be. I looked around to see if any of the two-legged San Antonians would react but no one so much as noticed the horseplay. Ah, to be a horse in San Antonio! 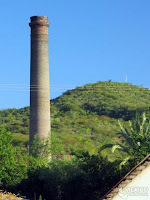 El Triunfo can be seen for miles away by its distinctive defunct red brick smoke stack (designed by Gustav Eiffel!) towering 35 meters above the rocky soil. I tried to imagine when El Triunfo was home to more than 10,000 miners and the smoke rose continuously from the stacks of the Progresso Mining Company smelters but it was hard to picture. The mines shut down in 1926 sending most residents off to seek other opportunities.Today the town is home to just a few hundred people and one very unique attraction. In its heyday the town was a cultural center, where famous Chilean music prodigy, Francisca Mendoza, taught and performed. A well maintained hacienda is still home to the El Triunfo Music Museum which exhibits pianos from all over the world. Getting out of the Nissan to explore the museum, Fernando mentioned that his Grandfather’s piano is among those on display. Now we are getting somewhere, I thought! As Celia and I milled about, Fernando walked with purpose from room to room trying to locate his family heirloom but it was nowhere to be found. He spoke with the sluggish curator who assured him that General Ortega’s piano is “at the shop.” Fernando was not buying it and he was quietly agitated when we climbed back in the truck. On the way out of town children lined the road holding out silver paint buckets brimming with red fruit. “Pitayyyyyyya!” they shouted. Snaking back up and over the mountain, I catch a glimpse of El Triunfo down below and Baja’s own Eiffel Tower lit like a burgundy spire rising from the green village canopy. I thought to myself, it may be Gustav’s best work. Back in Todos Santos, Fernando asked if there is anything else we’d like to do. “I’d like to see some horses,” said Celia, who had been silently sitting in the back of the car for miles. Veering to the left Fernando began to drive through the town’s western “suburb.” As we rounded the road to La Poza, a well known hotel and beach access, he said, “I live there in the little cabin below the big house.” The small, traditional adobe cabin is exactly what I would have expected of Fernando, now having spent time with him. Solid, earthy, without a hint of pretense, yet positioned on the same ocean -view hillside as the million-dollar mushroom homes that pop up year after year. We drove through the fertile green valley that lies in the lowest portion of Todos Santos where Fernando’s horse is kept by the farmer. We search every corner of the farm passing palms, peppers, and mangos but no horse. Again, Fernando quietly stews. What a day he’s had! While chauffeuring two gringas all across the peninsula he learned of a friend’s death, the loss of a great family heirloom and now finds his horse missing. I feel petty for my camera woes. Back at Bob’s, I offer Fernando a cold beer which we drink under the hule tree by the pool. Finishing his beer he excuses himself saying, “I have to go see about my horse,” no euphemism intended.